Do the Holidays Wear You Out? If you take on so much extra work over the holidays that you have no time to enjoy the festivities and you need all of January to recuperate, it’s time to call a halt. 12 and get left with the clean-up? Do you do all the decorating, shopping, wrapping, and even gift-delivery yourself? If you do attend a gathering, do you spend hours preparing something special to contribute? When a friend, family member, or your child’s teacher calls to say “Would you…” do you immediately say yes, and take on even more work? If the answer is yes, it could very well be that you are a Centaury personality in a negative state. It’s in your makeup to want to help and to please others, but in the negative state you let it go too far. Your positive desire turns into a negative as you become a slave to every whim except your own. This year, do yourself a favor. Get over to Feel Bach! And get a bottle of Centaury. Then begin taking 4 drops, 3 times each day. 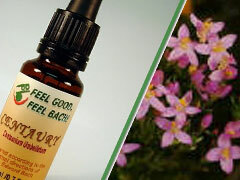 Centaury will help you realign your energies and connect with the powers of your own will. Does this sound like I’m suggesting selfishness? I’m not. The fact is, when you begin to enjoy the holidays and the activities you choose to do, the people who love you will also benefit. You’ll be more available to them emotionally and you’ll be much more fun to be around. This year, empower yourself to say no – and enjoy the holiday season from start to finish.